Breivik's lawyer accused Norway of violating a ban on "inhuman and degrading treatment" under the European Convention on Human Rights by keeping the 37-year-old isolated from other inmates in a special three-room cell. "There is no tradition in Norway for this type of isolation," lawyer Oeystein Storrvik told the special court that will meet until Friday in a gymnasium at Skien jail about 100 km (60 miles) south of Oslo. And speaking of imperfection, that salute is still a little bit off. I mean, it's miles ahead of giving the black power salute while advocating for the preservation of Europe, but still. The court met in a gymnasium with hoopity-ball-nets. Anders looks like he is saying "This is the minimum height I want for players on my team." Anders, your ideology has never been as important as your actions. You're no Nazi. But it was a good way to get the Mass Media to remember your contribution. The interwebs are filled with pathetic, toothless ideologues, each spouting 14 or so of the 88 variations of the same damn pro-White talking points. You, on the other hand, actually did something based on your beliefs. That is as rare as hen's teeth. The inactivists for the preservation of White European people condemn your actions as they wait around for the glorious peaceful revolution that they say will save them from extinction. The majority are still so deluded they think they can vote their way out of White genocide, HA! The rest think they can come up with some new philosophy that will overpower the death urge of Western Civilization. That is slightly less laughable, in that at least it requires more brainpower than voting for your favorite reality TV star. But you ... you did something. HA! It's a perfectly cromulent first name for a lawyer. Oeystein is the Faroese variant of Oystaeinn, a Nordic name meaning "stone island." Variants include Suomi Osten, Norwegian Ostine, and many others. Sometimes Anglicized as Augustine. Ah. Well, thank you very much for the clarification. "The inactivists for the preservation of White European people condemn your actions as they wait around for the glorious peaceful revolution that they say will save them from extinction. " Indeed, it is a sad state of affairs when even a non-white is more likely to understand what is necessary for our survival than the white whateverist that condemned Breivik. Thank you for the link, william. 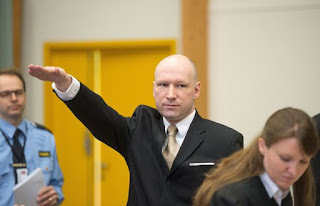 "Creeps like Breivik embody traditional Jewish hatred of their enemies and commit evil and unspeakable acts of violence, often against our own people." What's that? White Leftist traitors (and their spawn-in-training) who flood White homelands with non-Whites are "our people". Duchess lumps himself in with them for what possible reason? If I was conspiracy minded, I would say it was a candid admission of who his true allies are. But since I am not conspiracy minded, I will say that Duchess once again was spinning the story trying to protect his personal brand of profitable inactivism.